Good things come for those who wait.Are you still on the fence about buying the newest Nintendo console? Well, Nintendo hopes to help make your decision in their favor with a new Wii U bundle available Sunday February 17th. 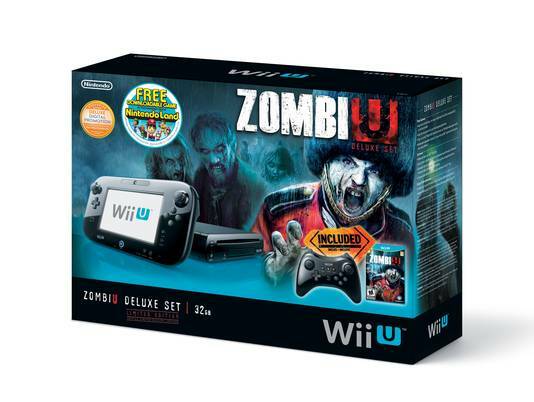 The exclusive bundle entitled, The Wii U ZombiU Deluxe Set, will include a Deluxe Wii U (32GB), a Pro Controller, a copy of ZombiU with an art book and developer commentary, a download of Nintendo Land and enrollment in the Deluxe Digital Promotion. The MSRP for the new bundle is $390. Since launching last November, Nintendo has sold 3 million Wii U units. I can only imagine Nintendo is trying to attract gamers to their system before the potential unveiling of both the PS3 and XBOX 360 successors in the coming weeks. Will you be going out and purchasing this new bundle, are you still hesitant on shelling out your hard earned money on a system that is losing exclusive rights to video games (Rayman Legends), or are you content without having the Wii U in your collection?